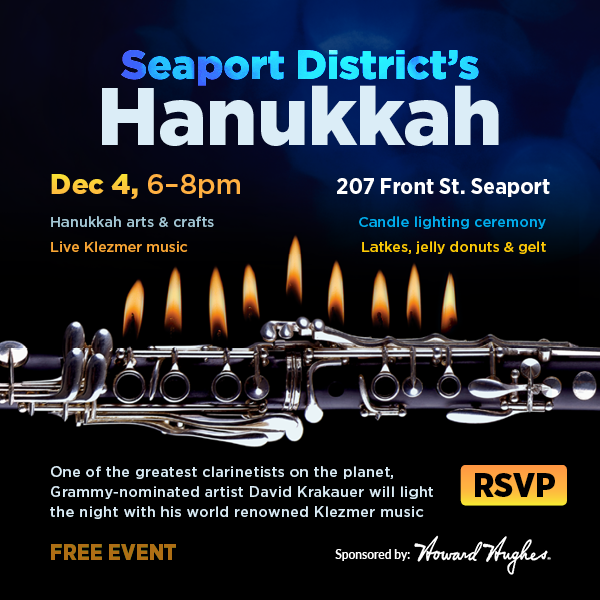 Please join us for this wonderful, free event sponsored by the Howard Hughes Corporation, in the historic Seaport District to celebrate Hanukkah with latkes and jelly donuts, arts & crafts, live music, and guest speakers. One of the greatest clarinetists on the planet, Grammy-nominated artist David Krakauer, will light the night with his world-renowned Klezmer music. Cynthia Rowley’s Seaport location will be serving complimentary bubbly & offering 20% off all items from 6:00 pm – 8:00 pm on the eve of the event. Meet the author & illustrator of “Schmuck the Buck” and receive a complimentary signed illustration. Rabbi Katz of Chabad of Wall Street will officiate the ceremony and VP of The Howard Hughes Corporation, Saul Scherl, will say a few words. There will also be indoor space to keep warm. See why Time Out New York listed our party as top 5 Hanukkah parties in NYC for 2018! We look forward to lighting up the evening with you as we celebrate the Festival of Lights. To RSVP, please visit the registration site HERE. Join FiDi Families at the 7th annual event at the Seaport District. The Taste of the Seaport helps raise funds for students at the Spruce Street School as well as Peck Slip School, for much needed enrichment programs for these wonderful neighborhood schools. Enjoy great food, live music and family-friendly activities on the cobblestone streets of New York City’s historic Old Seaport neighborhood. Not only are there more than 40 local restaurants and vendors on hand to sample amazing food and treats for attendees but children’s activities and musical entertainment will also be available. Tickets are on sale now and can also be purchased at the event. IBIS at Little Water Radio NYC. IBIS- Actually Better In Script will offer a lyric and performance workshop from February – April. Students are encouraged to incorporate truth from their own lives and perspectives into their lyrics. They will practice emotional communication through the written and spoken word. This workshop will motivate participants to recognized gifted skills while forming bonds with other artists. This workshop is a 5 week cycle of 2 hour sessions held on Saturdays. IBIS is part of Out To See, a yearly festival held at 192 Front Street held from January – April. This event features art, music, and film in the appropriate setting of NYC’s Seaport District. Each week presents a collection of artists. OTS3 is presented by the Seaport’s local radio station, Little Water Radio and is generously supported by the Howard Hughes Corporation. Enjoy additional programming brought to you by Animation Nights New York, Northern Spy Records, Paper, Garden Records, Alrealon Musique, Hans Tammen, Chris Carlone, Talibam!, Endless Editions, and more! Art Start Family Workshop. Make your way to the Seaport this Saturday for a morning of making a homemade checkerboard! Add to your family game nights with your very own masterpiece, this may even spark an interest and motivate your children to learn the game or for you to refresh your memory. You’ll be able to choose your own colors as you design your custom made checkerboard. Your children will be happy adding to their collection of games and toys, and being able to say they made it all by themselves or with the help of their family. Art Start focuses on the youth of NYC through free creative workshops open to the public in different venues, inside homeless shelters, programs, and other youth agencies. Art Start is a member of the Seaport Culture District. An outdoor light-and-sound installation in Cannon’s Walk is currently featured at the South Street Seaport. Seaport Culture District Welcomes Art Start! Seaport Culture District Welcomes Art Start! The Howard Hughes Corporation recently unveiled the Seaport Culture District, a new group of partners and organizations bringing culture to Lower Manhattan. From mid-August to December, the Culture District will provide authentic NY cultural experiences through food, fashion, entertainment, art, design, history and more! This is the best way to represent the vibrant and unique bustling downtown neighborhood that we all know and love! Art Start will be the kid-friendly addition to the Seaport Culture District with a convenient and familiar location at Cannon’s Walk. This award-winning organization used creative art projects to restore the hopes of homeless youth. Art Start will partner with Rosemont Press and Arup to host Portrait Project. This entails a light-and-sound-installation in Cannon’s Walk offering an inspiring and enlightening look at the hopes and dreams of Art Start teenagers. Art start is also partnering with Fast Ashleys Studios, Anyway Reps and DCOY Studios. Keep your eyes open for upcoming educational programs for ages K through 12 at the Seaport Culture District! Date: Monday, August 24th through December 2015 [Read more…] about Seaport Culture District Welcomes Art Start!